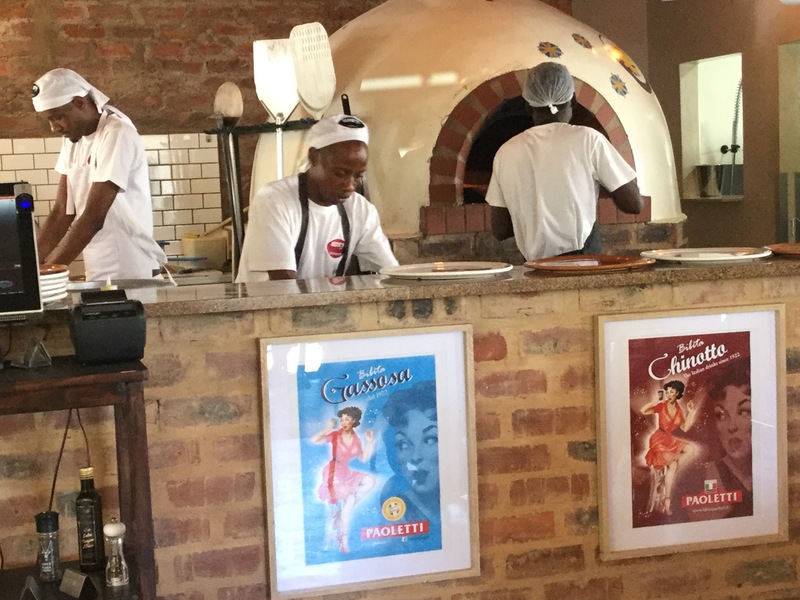 No danger of anything unpleasant at the excellent Alfie’s Pizzeria in Pretoria, which is a relatively recent addition to the Alfie’s Empire. Indeed, the name is misleading. It is so much more than a pizza place. They will serve you a large steak, a plate of excellent pasta, a range of sandwiches and cold platters, as well as the best pizzas I have tasted in a very long time. The secret is simplicity. Like all the best Italian restaurants – or indeed all the best restaurants of any nationality – Alfie’s Pizzeria uses great ingredients and prepares them well. The last pizza I had there was the Alfie’s special – superb cherry tomatoes, freshly sliced prosciutto, crumbled cheese on a beautiful base. The pizza oven is always working, with two or more pizza chefs who know their craft and perform it superbly. With love. And real parmesan. If you are lucky enough to bump into Chef Patron Nicky Geerts (his friends call him Nicky; I call him Nicholas), ask him to prepare you one of his pastas or gnocchi dishes. The man has a magic touch, even with something as simple as a few appetite-whetting crostini. Pop into the adjacent deli and you will see the secret. Cold cabinets of real Italian ingredients. No parmesan from Potch or salami from Springs. These treasures are for real and put the food at Alfie’s Pizzeria high above the norm. The place is in a tree-lined side-street, and has both an indoor dining area and a terrace with tables. I find the latter a bit warm in summer, but there are fans to cool you down. The wine list is limited but good, there is an excellent choice of draft and bottled beers, and a quite impressive range of cocktails. So, the choice is yours. A beer and some pizza, or a sandwich, or a three-course meal (and don’t get me started on the desserts, as I find it impossible to stop…). The deli has its own seating area which is ideal for morning coffee, and there is a breakfast menu as well as. If you don’t believe me, give it a try. But if you really prefer the dog-vomit encrusted pizzas which you so often find in South Africa, you may not be happy. Alfie’s Pizzeria has no pretention, but its standards are high. NB: A block away from the pizza place you will find the original Alfie’s, an Italian restaurant run by a chap called….? You guessed it! Alfie. A more robust menu with more meat and fish and pasta dishes to choose from, and a chalk board of daily specials. No pretention here either. Just excellent food. The ice buckets leave a bit to be desired, and on my last visit I was presented with one made of flexible plastic, which looked more like a present pouch for a wine bottle than a sophisticated cooling device. But it worked. It is also worth being aware that these Italian hang-outs are in an area which is becoming very full of restaurants, and there currently isn’t much parking. However, if you find walking half a block from your car to the restaurant, you are perhaps not deserving of such impressive food. Previous Post Will a new SA investment promotion plan actually work?